Toft and Johnson may be idiots, but they’re not plagiarists. They’re not even remotely close to plagiarists. The cited passages don’t look even remotely like inappropriate copying. It looks like they read Ardrey’s book along with hundreds and hundreds of other books. The scant similarities are nothing to marvel at; academics read and regurgitate a lot of books and papers. You’ve utterly missed the point of the article, which was not, in fact, that Toft and Johnson are plagiarists. I thought I gave a broad hint to that effect by writing, “Far be it for me, however, to charge the two authors with anything so crude as plagiarism.” Apparently you didn’t catch on. Allow me to spoon feed it to you. The point of the article is that, yet again, two academics have decided they can dismiss the life work and legacy of Robert Ardrey by simply parroting the same utterly specious and bogus rationalizations that Pinker and Dawkins concocted years ago for doing exactly the same thing. “Hundreds and hundreds of other books”?? Get real! Name a single one that, like “The Territorial Imperative,” includes every significant theme that appears in Toft and Johnson’s paper. “Scant similarities”?? Surely you can’t be stupid enough to believe that. Have you actually ever read Ardrey’s work? The work of a brilliant man has been dismissed and his legacy ignored for reasons that don’t even come close to passing the smell test. There has never been a single great scientist who never had a wrong idea, or suggested a mistaken hypothesis. To pretend that Ardrey never happened, and that all the major themes of his work that have been triumphantly vindicated after his death don’t count, because he, too, had some wrong ideas, and made some mistakes, is absolutely unconscionable and unacceptable. I will continue to call it out every time I see it, whether you or anyone else likes it or not. That looked like a suggestion of improper copying approaching plagiarism to me. >Far be it for me, however, to charge the two authors with anything so crude as plagiarism. That looked like an accusation of academic misconduct to me. But since you hold a Ph.D. in Nuclear Engineering, no doubt you can use your academic prestige and connections to correct any and all injustices from Toft and Johnson’s works. I fear that I am too uneducated to discern the exact nature of their academic improprieties, but your fierce indignation leaves no doubt that you are competent to stand in judgement of them. Yes, not that I expect anyone else to attach any particular significance to my personal moral emotions, but you might say that I’m fiercely indignant. I’m indignant that Dawkins, while he was still a young striver on his way up would dare to court notoriety by claiming in “The Selfish Gene” that men who were not only greater but a great deal less arrogant than himself – Irenäus Eibl-Eibesfeldt, Konrad Lorenz, and Robert Ardrey – were “totally and utterly wrong.” I am indignant that, long after he had reached his place in the sun, and in spite of the fact that he, of all people, must have read and appreciated the significance of Ardrey, he never had the courage or common decency to set the record straight. I’m indignant that Pinker could have seized on Dawkins’ phrase as a specious rationalization for doing something as unutterably stupid and ludicrous as to write a whole book about the Blank Slate that ignored the role of the most influential and significant player in the whole episode – Robert Ardrey. And, by the way, no one needs to take my word for it. The Blank Slaters themselves admitted as much. I’m indignant that, having done something that stupid, Pinker, too, is now celebrated as a great public intellectual. 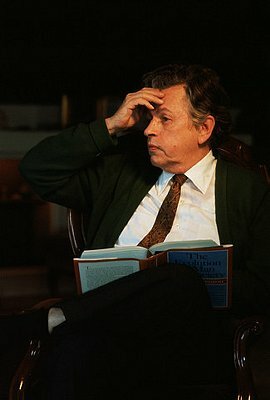 I’m indignant that Toft and Johnson, like two grotesque parrots, could uncritically squawk out the threadbare rationalizations of Dawkins and Pinker almost word for word to justify dismissing the importance and significance of Ardrey in the process of writing a paper full of themes that had appeared much earlier in his work. And, finally, I’m indignant that all this should have been done to destroy the legacy of a man who never responded in kind to the vile attacks that were directed at him during his lifetime, and who, instead of attempting to magnify himself by denying the contributions of the great men who preceded him, actually went out of his way to highlight their work, including many who were already nearly forgotten in his own time, such as Eugene Marais, Raymond Dart, Henry Eliot Howard, Arthur Keith and Carveth Read, to name but a few. Robert Ardrey deserved better. Zhai2nan2 does not seem to understand what you are saying. You are clearing speaking of similarities of ideas, not plagiarism. Maybe he doesn’t realize how controversial those ideas were, and still are. I am strictly an amateur but I keep seeing even simple blank-slate ideas over and over in the general press. I know there are still a lot of leftover Blank Slaters out there, Frau Katze, but trust me, when you see things like an article confirming Ardrey’s “hunting hypothesis” appearing in “Scientific American,” no less, it’s pretty clear their day is over.